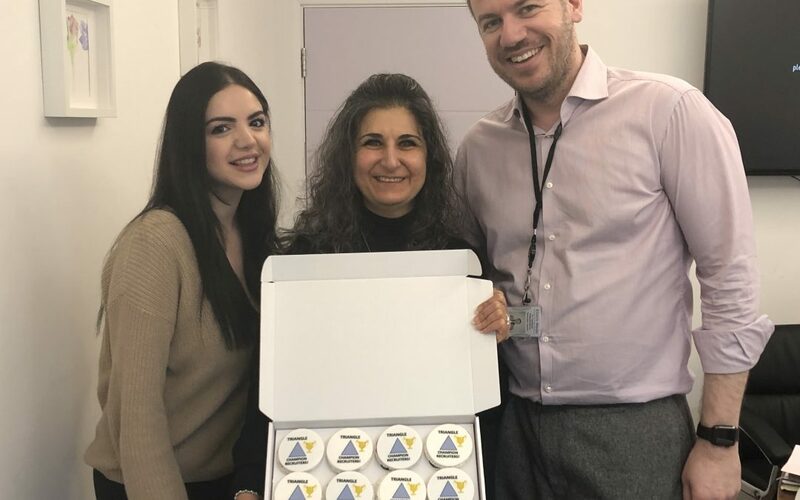 Ellern Mede has succeeded in recruiting adolescents to participate in the King’s College TRIANGLE study, winning a ‘Champion Recruiter’ award this Spring, celebrated with personalised cupcakes from the research team. Pictured are staff celebrating their gift which display the words ‘Champion Recruiter’. From left are Ezgi Killinc, Assistant Psychologist, Dr Kiran Chitale, Medical Director, and Dr Vas Papadimitriou, Specialist Doctor, all of Ellern Mede. “We have been observing an improvement in TRIANGLE recruitment over recent months with your wonderful help, so thank you to everyone for all your support with recruitment. Please continue to help us to stay on track towards our green target!” commented Katie Rowlands, TRIANGLE Project Research Assistant. TRIANGLE stands for Transition care in Anorexia Nervosa through Guidance Online from peer and carer Expertise. The study will focus on the transition from specialist inpatient hospital care for anorexia nervosa to home. It will look at the level of support and information needed during and after inpatient treatment. It is hoped that through the findings, the experience of patients and their families can be improved. The National Institute for Health Research Health Technology Assessment (NIHR HTA) programme is funding the study. The project will also test an adaptation to the well-known Maudsley model in the form of a new approach to treatment dubbed ECHOMANTRA. MANTRA stands for Maudsley Model for Anorexia Nervosa Treatment for Adults while ECHO is a peer coaching support model launched by BEAT eating disorder charity. BEAT’s Echo peer coaching is a free and confidential telephone-based service for anyone caring for someone with an eating disorder. It is based on the cognitive interpersonal model of Anorexia Nervosa treatment and includes assessments, workbooks, videos, online groups and joint Skype sessions for patients and carers. ECHOMANTRA adds this online and peer telephone support to MANTRA ‘treatment as usual’ (TAU) and seeks to establish whether this improves eating disorder recovery for patients involved in the randomised control trial. You can read the abstract for the study on our website here.